This great 1 bedroom, 1 bath Gulf side condominium is located in the Gulf Winds resort in a beautiful peaceful community of St. Pete Beach Florida. Enjoy Upham's white sandy beach and the turquoise waters of the peaceful Gulf of Mexico! You will be amazed every evening as you experience the gorgeous Florida sunsets. This impressive 1 bedroom condo is 'completely' remodeled, complete with all conveniences of home, a fully equipped kitchen, ceiling fans, crown moldings throughout, white window shutters and all the linens. The floor of the condo has been fully re-tiled with beautiful 16x16 tile. There are washers and dryers in the complex directly behind the unit. There is also a Shuffle board next to the laundry facility. The condo has cable TV with DVD and a large closet. The condominium has a very nice swimming pool and sits right in front of the Gulf of Mexico. It is located in a very secluded area 3 blocks from Gulf Blvd. The building and grounds are very nicely maintained. In addition to the beautiful grounds which are visible around the property, the condo has a small sitting area to sit back and enjoy the sunsets and beach breeze. 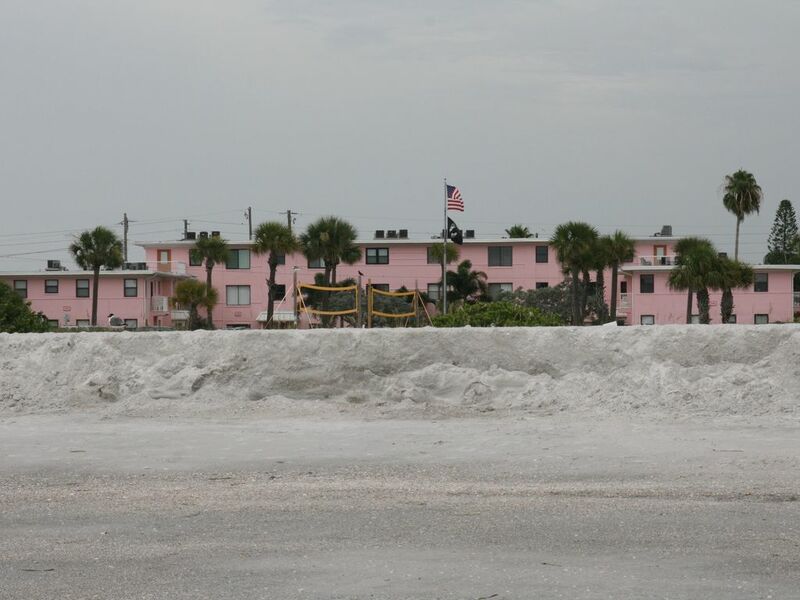 When you are on Upham beach you can enjoy many miles of the white St. Pete Beach sand! Within a few blocks, you can walk to several restaurants, grocery stores, ice cream parlors, and pharmacies that are conveniently located right on Gulf Blvd. Beautiful Pass-a-Grille beach and world renowned Fort de Soto Park, as well as the Don Caesar hotel are only a 5 minute drive. We are certain you will enjoy this tropical paradise! Walk across the parking lot to the white sandy Upham beach. This condo has everything going for it. Great location, nice space for two, well supplied from kitchen utensils to beach chairs. Easy check in and out. Owners are quick to respond. Great sitting area right outside the door. Comfortable bed. Perfect!! Super place and fantastic people to deal with! The place was extremely clean and had everything that we needed. No complaints... The beach was great and not really crowded. When you go to the beach, be sure to see Tom (super guy) to rent cabanas, umbrellas, and chairs. He is extremely nice and takes care of his customers. I would stay there again! Thank you for your review. I'm glad you enjoyed the condo and the beach. We had at least some rain every day but intermittently the sun came out enough to get a little beach time. Unit was definitely walking distance to the beach so that I could go over there several times/day (which was my goal) Furniture was comfortable and the kitchen well appointed. TV and internet worked well. A little confusing finding the unit because the address for the whole complex was 6800, yet there were 4 buildings. But not a big deal. The area was very quiet and peaceful. Thank you for taking the time to leave a review. I'm glad you got in beach time everyday! The condo property is very well kept, manicured lawn and clean. Condo itself is clean and and stocked with everything we needed. Very convenient location! We were able to walk to several locations to eat and of course the beach is just across the parking lot. The only downside is the beach erosion rehab things were a bit of an eyesore but, they also had some advantages and they were only in a small area. Lots of shells washed up nearby, made little coves for swimming and also a manatee swam around there. The water was clear and beautiful and we would definitely stay here again. Thank you for your review. We are glad you enjoyed your stay and welcome you back!